Which is the Best Blog Hosting Solution? Sometimes I feel like I’m asked this question more often than people Google it. If you have a self-hosted website (or are about to start one), you’ll probably want to know the answer too: Which is the best blog hosting solution? There are plenty of answers to this question. 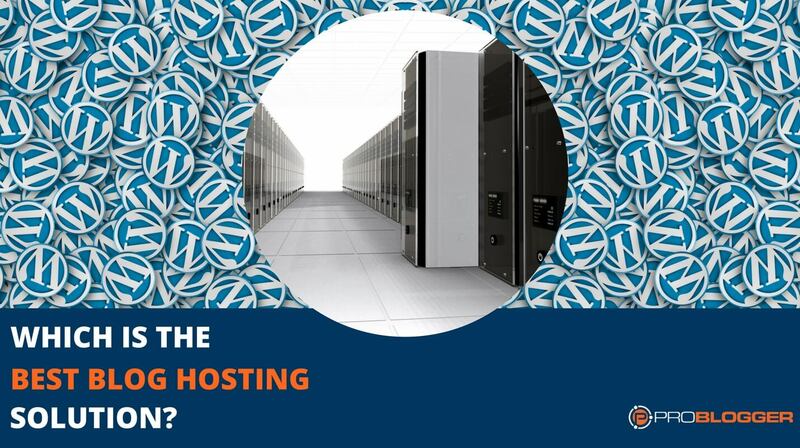 Check out the web hosting services topic on any forum or community discussion board, and you’ll see both glowing endorsements and damning negativity for every hosting company out there – no matter how good they are. You’ll even see entire sites dedicated to getting a referral commission for a specific blog host. But the truth is, there’s only one way to answer the question correctly. And that’s with, “it depends”. As bloggers, we all have different needs and budgets for our blogs. A new blogger starting from scratch will have different needs and priorities to an established blogger with a large audience. Weighing up these factors will lead to different solutions for different bloggers. Which means that as your blog develops you should be prepared to upgrade your hosting, or even change providers. Before you start asking for hosting recommendations or reading hosting service reviews, think about what you need from your host. If you don’t, you may wind up with a hosting company that doesn’t meet your needs as a blogger. Of course, you may not know what you need. Or you might be interested in what web hosting services best suit bloggers at various stages of their blogging, or what most bloggers prefer. feedback from people I know and trust. Do you need email hosting? Do you want your email address to be email@yourdomain.com? If so, then you need to stick with hosting companies that provide email hosting. Keep in mind that an email with your domain name looks more professional. Do you need large storage for media files? For example, do you plan on uploading videos, infographics, or high-resolution photos? If so, you’ll need a host that offers large storage solutions. But be wary of hosting services with unlimited storage. Some of them will limit your storage usage by capping your inode usage. Before signing up, ask your web host about inode usage. Anything below 100,000 inodes on a shared web host is unacceptable. Do you expect the site to grow fast? If you do, then you should probably stick with a web host that gives you room to grow. The more traffic you have, the more data transfer and CPU power you’ll need. Look at the cost of bigger packages and private hosting. Some hosting companies offer cheap rates for small packages, but charge much more than they should for larger ones. What other additional services you need? Do you need server root access? Someone to backup your site for you or automated backup? Automated malware scanning? These could all be deciding factors on your hosting choice. What is your level of hosting knowledge? Do you need spoon-fed support, or you can pretty much cover everything yourself? Do you prefer phone calls over live chat, or vice versa? If your knowledge is limited, look for a hosting company that caters to newbies or offers inexpensive tech support packages. Can you tweak and secure your own WordPress site? If you can’t, you may need a developer to do it for you instead. Some hosting companies provide their own web development services. But make sure you check the cost of using these developer services carefully. Does the company charge by the hour, or by the task? Will they teach you to manage your own backend on the server, or will you be paying them for eternity to update your site? Is the server location important? If you’re not planning on using a CDN, you probably want a server that’s closest to your targeted audience so your blog loads faster for them. This is a great summary of considerations for your hosting needs, and comes from a previous blog post written by regular ProBlogger contributor Jerry Low. Jerry also talked about seven ‘must-know factors’ about what makes a good host for you. Some hosting providers target uninformed shoppers, and are extremely overpriced. That’s why it’s important to compare web hosting companies and what they offer in their packages. User-Friendly Control Panel: Both cPanel or vDeck are easy to use, with many online tutorials available on various blogs to talk you through their use. Beware of custom-built dashboards. They’re very hit-or-miss, and can be downright painful to use. You should be comfortable with the payment plan. I’m okay with a yearly subscription if there’s a decent discount, but other people want more flexibility. Just because you don’t mind a yearly subscription now doesn’t mean it will always be that way. Look for a host with more flexibility, such as one-, six-, 12- and 24-month subscriptions. The control panel should let you install WordPress (or whatever content management system you want) with a few clicks. If it is too complicated to install the software, you’ll wind up paying a techie to do it, which will blow your budget. Check out the demo control panel before signing on with a hosting company to make sure you can complete the tasks you’ll need to easily. Bluehost covers these first three points really well, and is the main reason we recommend them for first-time bloggers. Make sure you can contact the host 24/7 for tech support. You should be able to contact them in multiple ways such as via email, a ticket system on their website, and telephone. There’s no excuse for repeated downtime. Your site simply must be up most of the time. Try for a site with a 99.9% uptime guarantee – 99.5% is okay (just), but 99.9% is better. And make sure they offer a guarantee. Don’t just take their word for it either. Track your site’s uptime with tools such as Uptime Robot and Pingdom. If you need (or think you might need) e-Commerce solutions down the track, make sure you have SSH access, SSL certificates, and even easy-to-install shopping cart platforms. We see numerous bloggers praising Siteground on their attention to those last few points. They seem to be very responsive to support requests, and will help you migrate your site from other hosts. We’ve heard very few complaints about downtime, which is important once you start monetising your traffic. And for your e-Commerce requirements they include varying SSL certificates based on the plan you choose. Can the hosting company grow with you as your site grows? Can you upgrade to a VPS or a dedicated server? While it’s smart to start with a good shared hosting account, you may quickly reach the point where it just makes sense to upgrade. And when that happens, you don’t want to be moving your entire site if you don’t have to. Most web hosts can accommodate growth with different levels and types of hosting. Bluehost offers all four hosting options, while Siteground and WPEngine offer cloud and dedicated hosting in addition to shared hosting. As my blogs have grown I’ve moved through these types of services, starting with Bluehost‘s shared hosting in the very early days of my blogs. We recently moved from VPS hosting with Synthesis (which has incorporated their standalone plans into their StudioPress Sites offering), to VPS directly with Linode. We have multiple servers and multiple WordPress installations that make up both Digital Photography School and ProBlogger. A Virtual Private Server gives you more control and flexibility, and leaves you less vulnerable to other sites on a shared server affecting your site performance. It’s something you may want to consider if you have high traffic volumes and multiple installs. For most bloggers, shared hosting is sufficient and far more cost effective. Here are my recommendations based on different levels and needs of blogging. If you’re just starting out, or have a smaller blog, I highly recommend you check out BlueHost. One of the main reasons we recommend them for new bloggers is the price. When you’re just starting out, you don’t want the stress of high hosting rates when you haven’t started monetising yet. Bluehost has made it even more affordable for ProBlogger readers with a special discount that includes a free domain name. WordPress itself has been recommending Bluehost for web hosting since 2005. It has 1-click WordPress installation, and a great walkthrough site builder to get you up and running really quickly. They also offer a range of plans and server types, so your blog can grow without you needing to switch hosting providers. You may see reviews about customer service not being as great as other providers. But I think it’s in line with the price you’re paying. If you want a premium service, you pay a premium price. If you’re looking for an easy solution, have the healthier budget, and just want to get on with creating content and building your blogging empire, check out StudioPress Sites. It’s a fully hosted, all-in-one WordPress website builder that lets you own and control your blog, without having to worry about traffic limits. It comes pre-installed with the Genesis framework and 30+ StudioPress themes. One-Click Install of Included Plugins – Never wonder which plugins are trustworthy, thanks to your StudioPress Site’s repository of one-click solutions for the functionality you desire. Automatic Plugin and Theme Maintenance – Many WordPress site owners spend $$$ every month to have an outside service keep things updated and safe. Siteground is a service many bloggers in our community use and recommend. Like Bluehost, Siteground is one of only three web hosts that WordPress also recommend. Although Siteground’s basic plan is a little pricier than Bluehost’s, you may appreciate some of their more premium services as your blog grows. We recommend WP Engine if you’re looking to host an established site with more traffic (or want to position yourself for it in the future). WP Engine is one of the top WordPress hosting services in the market, but it’s also expensive and not suitable for everyone. You can use this link to get two months free when you sign up for an annual plan. some guidance on what works for different levels and types of blogs. I hope it helps you make your decision. The post Which is the Best Blog Hosting Solution? appeared first on ProBlogger.